It is a small, flexible tube, about ¼” in diameter that is an alternative route for nourishment and hydration. 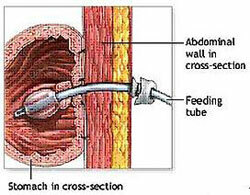 The kinds of tubes recommended for people with ALS are a PEG – Percutaneous (through the skin) Endoscopic (using an endoscope or flexible tube to view the digestive tract) Gastrostomy (opening in the stomach), or a RIG – (Radioscopically Inserted Percutaneous – through the skin - Gastrostomy tube). When should I consider getting a feeding tube? What are the advantages of getting a feeding tube? What are some reasons people don’t want a feeding tube? Insertion of a tube is a surgical procedure. A slight risk of infection at the tube site. It does not prevent the progression of ALS. How will I know if a feeding tube is right for me? When is the right time to have a feeding tube placed? Most doctors recommend getting a feeding tube early – before you absolutely need one. The sooner you have a feeding tube placed, the better your body will be able to recover from the procedure. When fluid intake drops… a feeding tube should be considered. Can the feeding tube be removed? Can I still eat with a fedding tube? Can I take medications through the tube? How is the tube placed? How many Calories are necessary to maintain proper nutrition? For example, a 127 lb woman or 58 kgs x 25 Cals =1440 Cals. What goes down the tube? The ALS Association thanks and acknowledges Theresa Imperato, RN and Lorraine Danowski, RD, from The ALS Association Greater New York Chapter and Certified Center at Stony Brook for sharing their time and expertise on this factsheet. Drawings by A.D.A.M.